The town of Fayetteville, N.Y., located about 10 miles east of Syracuse, is known as the boyhood home of U.S. president Grover Cleveland and the former headquarters of the L. & J.G. Stickley furniture company. But in the information world, the Fayetteville Free Library (FFL; fflib.org) has become recognized as a leader in the maker movement. The program’s innovative use of technology has led to greatly enhanced community outreach. FFL is led by executive director Susan Considine, a Library Journal Mover & Shaker, the winner of the New York Library Association’s Mary Bobinski Innovative Public Library Director Award, and a White House Champion of Change. She is a firm believer in the library as a facilitator and promoter of outreach to all segments of its com munity. This belief applies not only to patrons but also to FFL’s staff members. FFL is fortunate to be housed in an impressive and expansive facility. Its 46,000-square-foot building was formerly the Stickley headquarters and manufacturing plant; the library purchased it in 2003. As a result, FFL is not hampered by space limitations and has been able to create a wide range of innovative and attractive areas in addition to its traditional lending area: a cafe, meeting spaces, a digital creation lab, children’s and teens’ rooms, and a makerspace called the Fabulous Laboratory (Fab Lab). 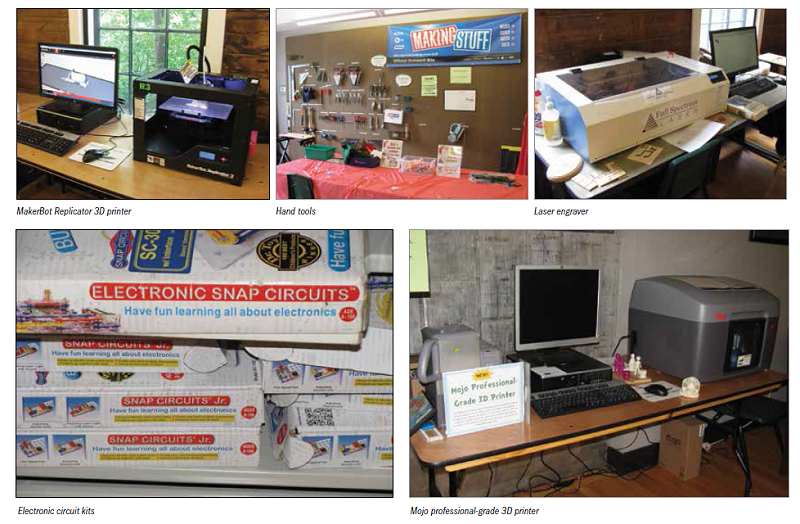 FFL was the first library in the U.S. to develop a makerspace in a public library setting. From the beginning, however, the emphasis was not on the technology but on training the library staffers and involving the community. 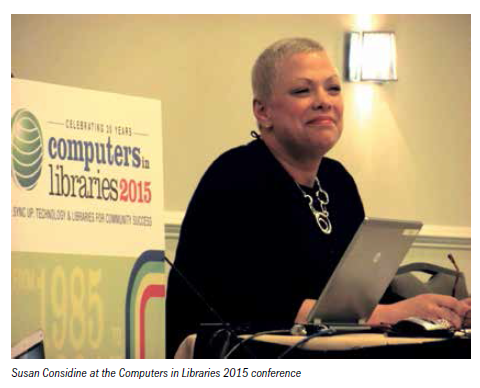 Considine emphasized the importance of community participation in the development of the makerspace in her presentation at the Computers in Libraries 2015 conference, which was appropriately called Community: Engagement, Partnership, and Impact. 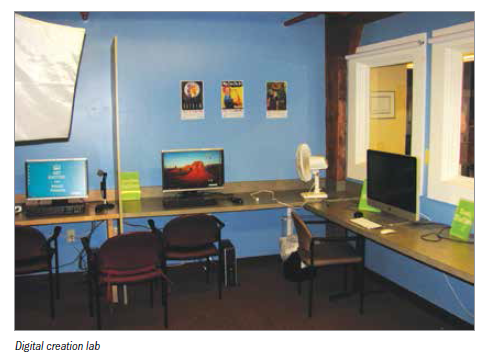 One of FFL’s early ventures into nontraditional library services was the establishment of a digital creation lab (fflib.org/make/creation-lab), which provides patrons with the facilities to make videos and other digital media productions. It has all of the necessary equipment, including computers, a green-screen wall, video cameras, and video production and editing software. A 3D printer was an early addition to the digital creation lab; it was the first publicly available 3D printer in the world. The genesis of FFL’s Fab Lab arose from needs expressed by members of the community, and the decision was made in 2011 to create a publicly available space to satisfy those needs. A common view of makerspaces today focuses on technology, with 3D printers often at the forefront. Technology is certainly important in FFL’s Fab Lab, but Considine emphasizes that it is not the main driving force. Making is relevant to the entire community, not only to hobbyists and technology enthusiasts. Thus, she sees the library’s major role as that of a facilitator to connect people and build the community, stressing that the library does not serve “users,” but “community participants.” The staffers listen to members of the community to gain an understanding of their interests, then provide a platform, add tools and technologies to the Fab Lab, and get out of the way, giving community members free rein to solve problems and share ideas and talents in their creative endeavors. It is important to note that nothing has been added to the lab that was not suggested by community members. The Fab Lab is housed in a large, brightly lit 2,500-square-foot area. It opened in September 2013, and the response from the community was immediate and enthusiastic and has continued to grow. On busy days, up to 100 people use the Fab Lab. People have come from all over the region and from as far away as Europe, Australia, and Korea to visit the lab. The demand for tours became almost overwhelming; therefore, FFL developed an Innovation Tour that is given at regularly scheduled times. The entire FFL professional team is involved in the tour program. Sewing: sewing machines, ironing boards, irons, fabric, pins, and thread, etc. Hand tools: hammers, screwdrivers, pliers, and wrenches, etc. Most of the equipment in the Fab Lab is available for use on a first-come, first-served basis. There is no charge to use the lab except to recoup the cost of materials. Before using certain machines, participants must have a “certification” session (individual training with a librarian that takes approximately 45 minutes and covers the usage of machines and tools and safety issues). All participants must sign an agreement consenting to the lab’s policies and read a safety guide before using the lab. The certification is noted in the patron’s library card account. The Fab Lab help desk is staffed by a library professional, support staff member, or community participant during a large portion of the day. Repair and maintenance of the equipment are the responsibility of the library’s two IT professionals. Education classes are an important part of FFL’s community outreach efforts. Classes are not only conducted by professionals; a wide range of experts from the community, from teenagers to retirees, share their knowledge and offer classes in their areas of expertise. Programs include individual instruction on sewing, 3D design, and software such as Adobe Photoshop, and weekly and monthly clubs on crafting, home repair, cooking, gardening, and robotics. 1,087 people were certified on the 3D printers, and nearly 9,000 hours of print time have been logged. 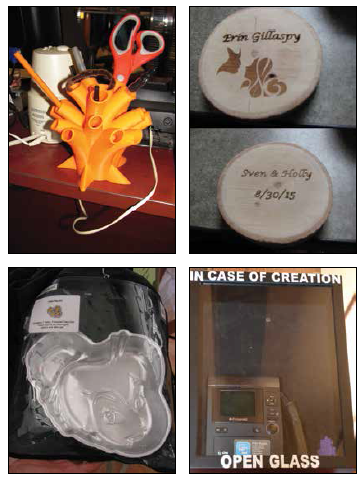 103 people were certified on the laser cutter and engraver. 44 people were certified on the sewing machines. 185 people attended 3D modeling classes. In 2012, community volunteers led 19 classes; by 2014, the volunteer education program had grown to more than 290 classes. In 2014, sewing class members made more than 200 items for charity from donated fabric. Participants have created vinyl letters for signs. One of the library professionals created a pen and pencil holder for the help desk using a 3D printer. A father developed a motion-activated switch so that his disabled daughter could change the music played on her toys. A woodworker used a 3D printer to design and print a part for a saw that is no longer made. Neurology students from a medical university developed a flexible brain stem model as a teaching tool using a 3D printer. Some of the Fab Lab equipment can be borrowed for home use. The cake pan pictured below, for example, has a 3-week loan period. On the day I visited the Fab Lab, a young lady who was engaged to be married was using the laser engraver to create wooden place “cards” for her wedding reception. One side had the names of the bride and groom and the wedding date, and the other was personalized with the guest’s name. She had about 60 to produce and said that it would take her about 4 hours. Uses for the Fab Lab are only limited by one’s imagination. And the lab has made it easy for participants to record the output of their efforts. Pictured below is the result of a very creative idea from the FFL team; this box containing a digital Polaroid camera hangs prominently on the wall. Children have not been left out of the maker movement at FFL. 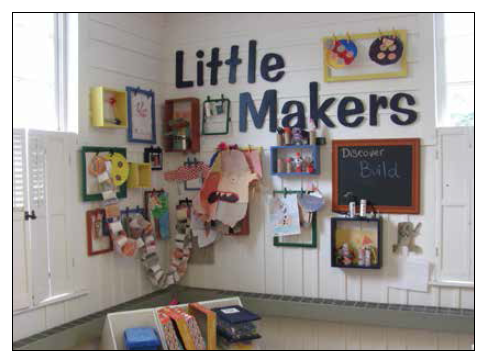 A designated Little Makers area was created in a corner of the children’s room. Kits (such as those containing LEGO blocks), paper, and other crafting materials that are appropriate for young children are available for their use, and their creations are displayed on the walls. One can easily imagine that participants using this area will be stimulated to “graduate” to the Fab Lab when they reach the appropriate age. The Fab Lab space was renovated with a grant from New York state. Fab Lab funding comes from the library’s operating budget, redirection of funds from underutilized resources, sales of materials, and income from its on-site cafe. The lab also accepts donations of materials. Considine told me that 6,000 square feet are available for expansion of the lab, and consideration is being given to the creation of additional specialized makerspaces. A music makerspace will provide facilities for the production of new music, digital music creation, and practicing. Entrepreneurs and businesses will have a space for the creation of pilot projects and the development of new services, etc. FFL has expanded from a community library into one with a global focus in which people are coming to the Fab Lab and experiencing it on their own terms. Making is relevant to the entire community and has many outcomes. Considine emphasizes that its power lies in its social aspects—sharing, creating new knowledge, and problem solving—not just in its technology. FFL’s view is that the library is an important facilitator in this process. Libraries are currently being subjected to rapid change as digital content is supplanting print, and the process has been painful for some of them. Budget cuts are widespread, the role of libraries is being questioned, and many libraries are being forced to justify their existence as the notion that “everything is available on Google” has become increasingly popular. FFL is a welcome and refreshing contrast to these trends, and its Fab Lab is a shining example of what creative thinking can do. It has taken a lead in the maker movement and has pioneered the concept of creation, not just curating. Donald T. Hawkins is an information industry freelance writer based in Pennsylvania. He blogs about the Computers in Libraries and Internet Librarian conferences for Information Today, Inc. (ITI), maintains the Events Calendar on the ITI website (infotoday.com/calendar.asp), and is the editor of Personal Archiving: Preserving Our Digital Heritage (ITI, 2013). He holds a Ph.D. from the University of California–Berkeley and has worked in the online information industry for more than 40 years.